I recently published an analysis of Newark's and Camden's graduation rates that contradicts the narrative that state control in both cities has led to improvements in educational outcomes. 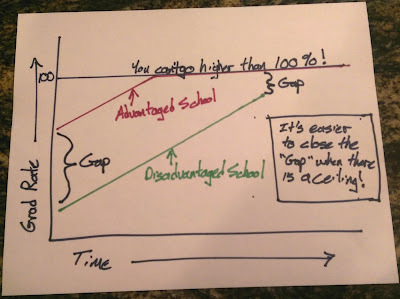 Soon after the brief came out, new graduation rate data was released by NJDOE; I updated my analysis on this blog, and found my conclusions hadn't changed. A reader contacted me after publishing this pieces; it turns out they had also been analyzing Newark's graduation rates, and came to the same conclusions I did -- but with a different take. I asked if I could publish their work here, and they agreed. Ex-Superintendent Chris Cerf and researchers who were paid by him have claimed persistently that state control and recent reforms of Newark Public Schools promoted student success. These advocates, along with the New Jersey Star Ledger, the Wall Street Journal, and several others, point to a rise in graduation rates at NPS as evidence of successful reforms. However, as rigorous and independently produced report after report after report have demonstrated, Cerf and his fellow advocates are wrong when they point to graduation rate changes as evidence that their favored types of school reform were successful. The 4-year graduation rate at NPS increased from 2011 to 2017. However, many similar districts – most of which were not under state control and did not go through the reforms seen at NPS – saw similar increases in graduation rates. Factors similar to all New Jersey students may have caused increases in graduation rates and not any unique changes in NPS. Moreover, some non-“reformed” districts that had democratic local control saw much larger increases in graduation rates. Consider the Orange Township, which is located a few miles east of Newark. The reported graduation rate in Orange increased 33 percentage points between 2011 and 2017. Newark’s reported rate increased 17 percentage points over the same period. Given that Orange’s increase was double that of Newark’s, it is difficult to support the claim that Newark’s reforms were necessary or relatively successful – especially if the goal was to increase graduation rates. Newark could have had a much higher graduation rate if Gov. Chris Christie’s Department of Education had not used its control of Newark to promote charters and advance other reforms that were not based in research evidence. Of course, a bald claim that state control caused harm to Newark’s children is too simplistic, although not necessarily wrong. But the claim that state-control, Facebook-funded charterization, or Chris Cerf himself caused improvements in Newark is equally simplistic. Comparisons among Newark and other school districts adds context and goes beyond simplistic propaganda. The graphic below compares NPS graduation rates to similar districts. 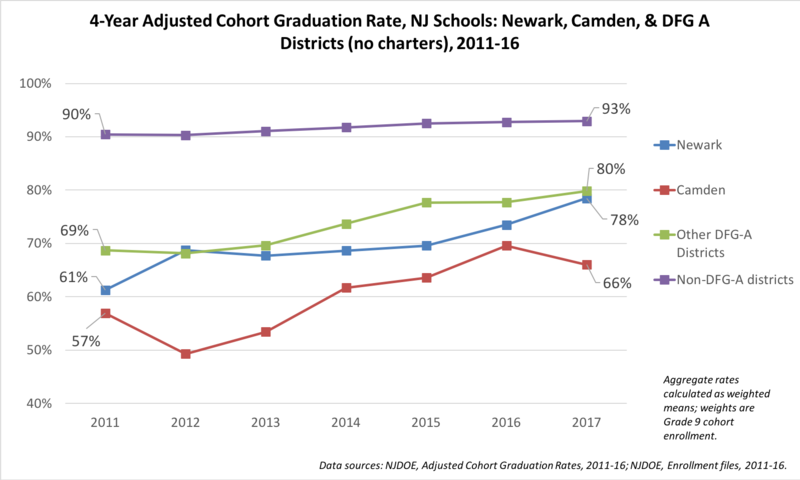 As this cut of the data shows, the NPS graduation rate increased at a slightly faster rate than similar districts in New Jersey in the last year, but at a slower rate, on average, in the six years prior. Note: NJ Districts w/ Free Lunch Rates >50% are averaged and included as “High Poverty.” This display includes districts with more than 3,500 students, which are more comparable to NPS (which has more than 35,000 students) than smaller districts. Including smaller districts does not change the general relationships, although smaller districts had higher graduation rates. 4-Year adjusted graduation rates and lunch data from NJDoE: http://www.nj.gov/education/data/grate/ and http://www.nj.gov/education/data/enr/. By one hopeful measure, the graduation rate at Newark would be just as high as districts with wealthier children. If state control, promoting charter schools, expanding teacher evaluation systems, PARCC testing, and “no excuses” mentalities were worthy of the turmoil they inflicted, then Newark children would have graduated at the same rate as wealthy children. But Newark’s graduation rate, after the “success” of state control and neoliberal reforms, is far lower than districts at the top of the income inequality pyramid. The interactive graphic below shows that in each of the last seven years, the relationship between economic status and graduation was quite strong. Richer districts remain in the top-left section, which indicates high graduation rates and low levels of poverty. Although graduation rates in Newark and most other districts shifted up over time, the relationship between economic resources and graduation rates was strong in each year. Note: This part of the analysis includes NJ districts of any size, which includes some charter operators. Also, the free lunch rate is for the entire district the year of graduation. The correlation between district free lunch and graduation rates ranged from -0.80 to -0.87 across the seven years analyzed, which indicates a strong, consistent and inverse relationship between the two variables. 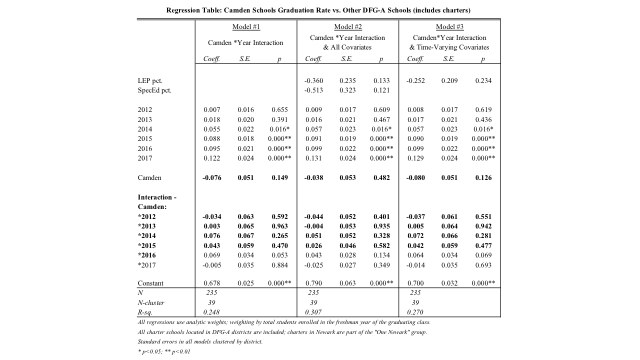 The relationship would likely be stronger if the free lunch data were for just the students in the graduating cohort. However, NJDoE does not make those data available publicly. Graduation rates for high-income districts were close to 100% for all of the last 7 years. The graduation rate in high-income districts thus hit a “ceiling” years ago. A ceiling is one reason that changes in grad rates are poor indicators of the contribution of schools to positive student experiences. For example, in 2011, Montville had a graduate rate of 99% and it remained at 99% six years later. An unchanging, maxed-out grad rate would be observed even if Montville improved the quality of the curriculum, decreased class sizes, taught more music and improved bilingual instruction. 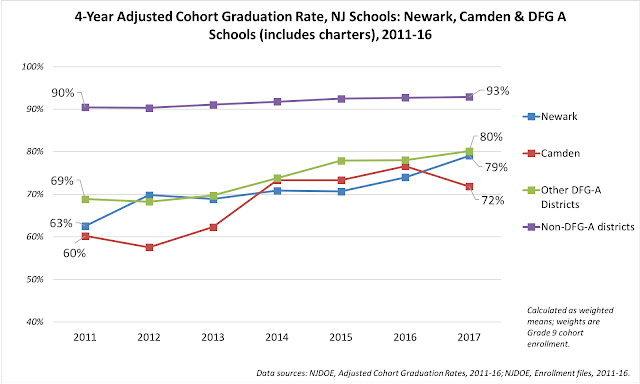 This contextualized analysis of graduation rates raises the specter that, although Newark’s rate increased over the last several years, that rise cannot be legitimately used to claim state control and recent reforms were beneficial. The duping machine of Cerf and the so-called reformers in Newark continue to propagate misleading propaganda based in simplistic portrayals of graduation rates. The same goes for a reformy crowd in the nation’s capital that lead the Washington D.C. school district into an FBI investigation of fraudulent graduation rates. Whatever spin the duping machines produce, it is clear that a country that allows only the richest children to be at the graduation “ceiling” needs something quite different than recent school reforms. p.s. There are a number of fast moving dots in the animated figure above. Some districts move quickly along the horizontal axis from year to year because the reported free lunch rates varied wildly. This is likely due to measurement error. This issue is especially significant between 2014 and 2015, which indicates a massive error in the data made available by the NJDoE. For example, it is unlikely that Bridgeton City went from 4,909 students eligible for free lunch in 2014 down to 596 a year later. The observed relationship between graduation and economic position would be even stronger without this measurement error. p.s.s. The definition of the graduation rate changed throughout NJ around 2011, so claims about changes over time that go further back (as when Cerf and others claim the graduation rate at NPS was in the 50’s at one point and now it is significantly higher) are misleading and ideological. It's been a good long while since we've played Spot The Pattern™. Ready (all emphases mine)? Mackay is one of the thousands of teachers on one side of a six-month (and counting) contract battle with the 29,000-student public-school district. The teachers have worked under an expired contract since the start of the school year and negotiations have stalled over whether teachers should pay less toward their health care expenses. The teachers call it "Chapter 78 relief." Chapter 78 is the 2011 law that revamped how New Jersey's public workers pay for their health benefits. It required school employees to pay a portion of premiums, with amounts rising over a four-year period. In Jersey City, that period has ended, so teachers can now ask the school district to shoulder more of the cost. The dispute has statewide implications. If the teachers union, the Jersey City Education Association, scores a victory in Jersey City, other districts could follow. The district's costs for employee health benefits for the 2017-18 school year is $98.9 million. The district's total budget is $682 million. Since 2011, the amount teachers pay for their benefits has risen nearly 400 percent. For the 2010-11 school year, the amount was $4.2 million. This year, teachers pay $19.9 million. In that same time period the district's share rose from $55.6 million to $79 million. CHARLESTON, W.Va. — West Virginia public school teachers launched a statewide walkout Thursday that canceled classes in all 55 counties, protesting over pay hikes signed by the governor hours earlier that the teachers say don’t go far enough. Thousands of teachers and support staff converged at the gold domed Capitol in Charleston on Thursday, seeking to pressure lawmakers who are still considering other proposals for them. It was their first statewide strike since 1990 in West Virginia, where teacher pay ranks 48th in the nation. The walkout is scheduled for two days, and teachers say they’re willing to go longer if need be. Chants of “Do your job so I can do mine” reverberated throughout the Capitol halls, along with other slogans including “55 strong” – a reference to the state’s 55 counties. Gov. Jim Justice on Wednesday night signed a 2 percent raise next year for teachers, followed by 1 percent raises the following two years. But teachers say the increases are too stingy. They also complain about projected increases in health insurance costs. Health insurances costs also remained a big sticking point. The Public Employees Insurance Agency, or PEIA, has agreed to freeze health insurance premiums and rates for the next fiscal year for teachers and other workers. The House passed legislation to transfer $29 million from the rainy day fund to freeze those rates, a move that awaits state Senate action. Ted Cheatham, director of that agency, has said that because of medical inflation, about $50 million to $70 million would be needed annually to keep the program functioning as it currently does. I could probably go on, but you get the point: teacher health care costs are driving up the costs of public schooling, and that's putting fiscal pressure on taxpayers. However, the debate around the nation always seems to be about how much more teachers, and all public employees, should contribute to their health benefits -- but not about how to get the costs of those benefits down. 1) There is little empirical evidence that suggests public employees are overpaid. Sure, there's plenty of right-wing, think-tanky stuff out there that suggests public employees are rolling in it. But the methodology for much of it is questionable. High-quality research suggests, instead, that there is a small but substantial penalty paid for having a career in public service. 2) There is a good bit of evidence that suggests there is a compensation penalty for teachers -- and it's not made up by pensions or health care benefits. As this debate -- Jason Richwine and Andrew Biggs vs. Lawrence Michel and Joydeep Roy -- shows, the only way to make an empirical case that teachers are overpaid is to engage in variable cherry-picking while making your statistical models, overstretch the length of the summer furlough (it's not "summer vacation" -- it's a mandatory, unpaid leave), and assume teachers who leave teaching are the same as teachers who stay. 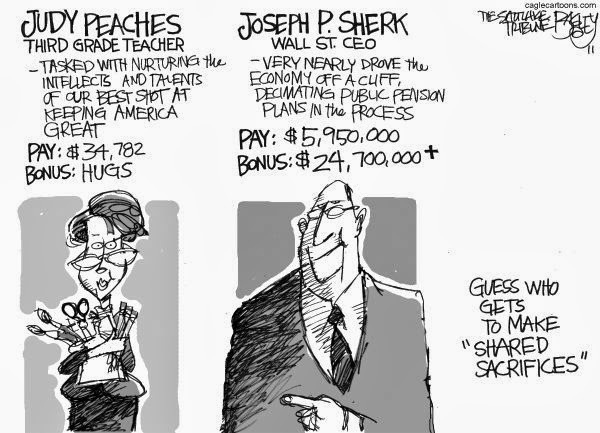 The teacher pay penalty is bigger than ever. In 2015, public school teachers’ weekly wages were 17.0 percent lower than those of comparable workers—compared with just 1.8 percent lower in 1994. This erosion of relative teacher wages has fallen more heavily on experienced teachers than on entry-level teachers. Importantly, collective bargaining can help to abate this teacher wage penalty. Some of the increase in the teacher wage penalty may be attributed to a trade-off between wages and benefits. Even so, teachers’ compensation (wages plus benefits) was 11.1 percent lower than that of comparable workers in 2015. Here in New Jersey -- often cited as a state that is generous to teachers -- there is a clear compensation gap with similar workers in other fields. The notion that pension benefits make up for this gap is undermined by the fact that this state has one of the least generous retirement benefit packages in the country. In addition, New Jersey public worker health insurance is, depending on the particulars, less generous than insurance for similar workers in the private sector. 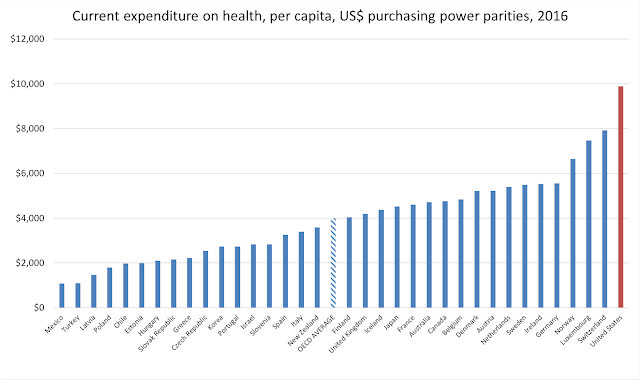 3) Compared to the rest of the world, the United States way overpays for health care. 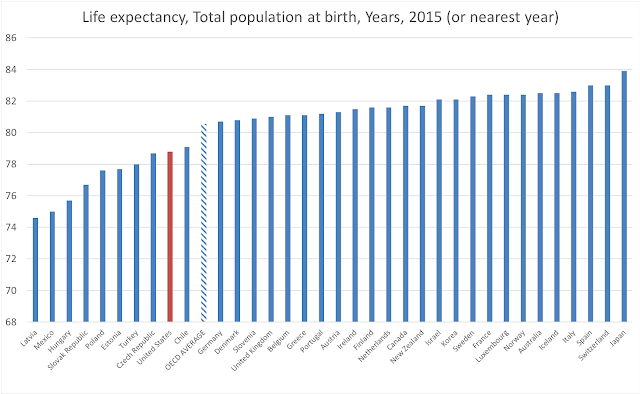 Here are some quick graphs I made based on OECD data. As a percentage of the economy, we are spending way more than other countries on health care. And in real dollar terms, we are spending way more than other countries on health care. The logical conclusion here is that the US is way overpaying for health care for everyone, including teachers and other public employees. For a while, we made up for the teacher pay gap by giving them comparatively good health benefits. But the costs have become so high that we can't afford to do that anymore. So how do we solve this? Demand even more money from public employees for mediocre care? That doesn't solve the core problem: health care costs are way higher than they should be. Pretending that teachers are overpaid, in spite of all the evidence that says they aren't, just distracts us from coming up with a real solution. If we could get all public employees into a plan that was similar to the plans of many other developed nations, we could probably save taxpayers a lot of money, and provide health care at least as good, and maybe even better, than what we are currently providing to public employees. Wouldn't that be a good thing? Shouldn't that be our focus first, rather than trying to get even more money out of public employees for a health care system everyone knows is too damn expensive? In both cases, we're assuming that the real problems are so big and so intractable that we can't just choose to fix them. The best we can hope for is to continue along with the same, failing policies we have now, at the expense of people who are hardly at the top of the economic food chain. So we fault teachers -- teachers! -- for having health insurance that's too cheap and too good. 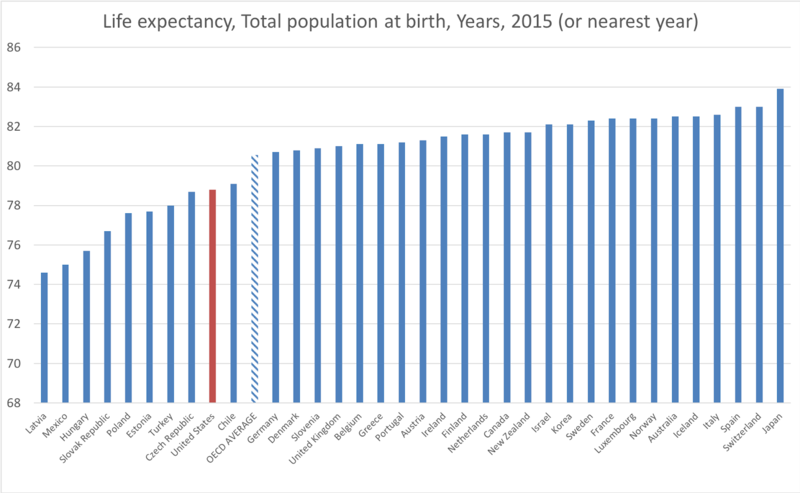 And the real problems with our health care system never get fixed. Health care doesn't have to cost so much more in America as in other places. We, as a country, choose to pay much more than we should. We could choose to move to another system -- even just for public employees. 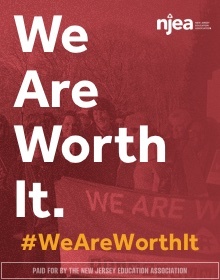 But we don't, because we choose to have a government more responsive to the desires of corporate interests than to the needs of government employees or best interests of middle class taxpayers. Again: it's not like teachers and public employees have been raking in the bucks, and it's not like we haven't been paying more and more into our health benefit packages while getting less and less. 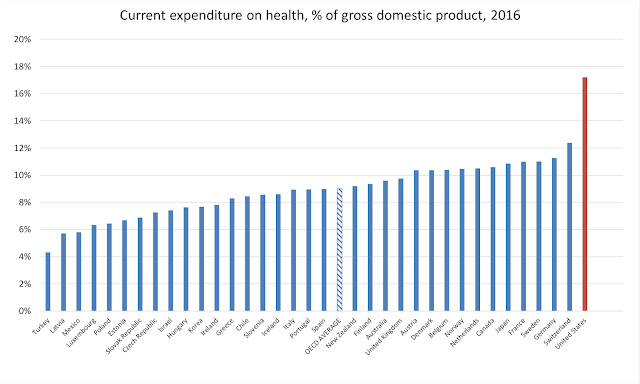 So, before we start demanding even more from teachers and other public workers, let's start putting some real effort into containing the exploding costs of health care. It would be better for almost everyone if we did. UPDATE: A reader points me to this 2014 piece by Russ Moore, a gun owning principal. It's good. UPDATE 2: I wrote this before Trump started babbling nonsense about arming teachers. I really didn't think he would actually propose such a ridiculous idea (silly me), but now that he has, there's been a groundswell of opposition. When I say below "I know I'm going to get a lot of grief," I'm not at all implying this post is unique. Trump moved this debate from the fringes to the mainstream -- such is the power of the presidency. Arming teachers is a bad idea. I know there are a sizable number of teachers who are licensed, responsible gun owners. No one I know wants to take away your right to have a gun, although plenty of us want greater regulation, as is demanded by the Second Amendment*, than we have now. - Armed teachers are not adequately trained or experienced, and they never will be. Your proficiency with a firearm is not adequate qualification for you to be carrying one at school. You might be able to hit a target every time, but you will never have the training or experience to be entrusted to know which target to hit. "Oh, I'll train during the summer." That's not enough. Law enforcement officials go out on the streets every day. They get experience every day. They are supervised in the use of deadly force every day. There is no conceivable scenario where you can meet your obligations as a teacher and receive adequate training and experience so you know not just how to use a deadly weapon, but when. "But I was in the military." Thank you for your service. But military experience is not the same as civilian law enforcement experience. The rules of engagement are not the same. The environment of the battlefield and the school are completely different. And no one ever expected that you could engage the enemy while simultaneously teaching children -- two tasks with extraordinarily large cognitive loads that, if we're being honest with ourselves, no human being can do at the same time. - We can't afford it. There is no way the American public would ever accept armed educators in the classroom unless they were regularly screened, trained, and supervised (even then, I'm betting most parents would be against it). This costs money -- money we could be spending on school facilities, salaries, curriculum, etc. You can't expect to arm teachers and not increase their workload. You can't expect to increase their workload and not pay them more. But why would we pay teachers more to partially train them in law enforcement techniques when we could instead pay them more to train them to be better teachers? - There's no evidence it will work. I'm not going to wade into a long battle over the evidence on gun proliferation and crime. Suffice to say there is an extraordinary amount of junk research out there**, and both-sidesism runs rampant. A large part of the problem is that the Centers for Disease Control has been prevented from engaging in research on the correlation between gun ownership and gun violence. If you want to ignore the reams of evidence that shows gun ownership does not lead to a reduction in violent crime, I can't help you. But at least show me a body of high-quality research that supports the contention that arming teachers will make students safer. Not anecdotes; not non-peer reviewed hack junk. I'm talking serious, empirical evidence. Where is it? - It's completely impractical. The premise for arming teachers is that they will have their weapons at the ready on a moment's notice as they will be the first-responders to a gun attack. Which means they will have to carry a loaded weapon with them at all times. A law enforcement officer's foremost priority is making sure her weapon is secured. A teacher's foremost priority is the needs of her students. These are not the same things. It is very easy to imagine all sorts of scenarios where a teacher needs to focus completely on a student to the exclusion of everything else. But that can never happen so long as that teacher has to put the security of their firearm first. The more you think about this, the more absurd the whole idea becomes. Are you really suggesting a gym teacher should lead his students in basketball drills with a gun strapped to his chest? A music teacher should conduct a choir with a sidearm? A kindergarten teacher should give a hug to a crying child while carefully making sure that child doesn't touch her gun? - An armed teacher will always be suspicious. I'm sure most of the teachers who are calling to be armed are very nice folks who have the best of intentions. But are we sure all of them are? Teachers are generally stable, moderate people. But they're people. They have bad relationships and battles with addiction and personal demons at the same rates as everyone else. Are we really confident we can screen out teachers who shouldn't be armed? One bad call is all it will take. Look, we can have a serious debate about how to protect our citizens -- especially our children -- from the horrific tragedies that are plaguing this country while respecting the rights of responsible gun owners. I have no problem with hunters and marksmen and people who need a gun for their personal protection. I agree that banning all guns will not solve our problems. But arming teachers is not a serious policy proposal; it is simply a bad idea. If we're going to create good public policy that protects students in schools, we should not waste time considering whether we should arm teachers -- that's a distraction we really can't afford right now. I worked with a retired NJSP officer who took a security job at a HS. He said he'd NEVER bring his gun to school because it might be taken from him in a scuffle and there was a HUGE risk of collateral damage in a group situation if he had to use it. He was a senior officer with 26 years' experience. I'm obviously not a law enforcement professional. But isn't this the reason why corrections officers don't carry weapons when they are in proximity to the prison population? Isn't this why police officers don't bring their weapons into holding areas? I made an assertion above that I really should confirm with law enforcement officers: when you are issued a weapon, isn't your top priority making sure that weapon is always secured? * "A well regulated militia, being necessary to the security of a free state, the right of the people to keep and bear arms, shall not be infringed." This week, the NJ Education Policy Forum published a brief of mine on graduation rates in Newark and Camden. Not more than a couple of days later, however, the NJDOE published new graduation rate data for 2017. Over the years, two cities in New Jersey have been held up as national models for education "reform": Newark and Camden. Both are urban districts with severe economic challenges, both have many children living in poverty, and both have large populations of English Language Learners. In addition, Newark and Camden have school districts that have been under state control for years: Newark since 1995, and Camden since 2013 (although Camden was subject to regulation by a state monitor well before that). Under state control, both cities implemented similar policies for their districts, including large expansions of charter schools. Both cities have been run for the past several years by state superintendents who were appointed by former Governor Chris Christie. Cami Anderson was superintendent in Newark from 2011 to 2015, followed Chris Cerf, the former state Commissioner of Education, who just recently resigned. Paymon Rouhanifard was appointed by Christie in 2013 and remains in his role. All three cut their teeth in the New York City DOE during the time when Joel Klein, a master of self-promotion, was the chancellor of schools. None had ever run a school district before taking their positions. In the past year, there's been a lot of talk about whether or not Camden and Newark have seen improvements during Chris Christie's two terms. As I explain in the brief, graduation rates are often brought up by supporters of Anderson, Cerf, and Rouhanifard as proof that their policies and leadership got positive results. Just this past week, for example, the Star-Ledger gave a glowing review of Cerf's tenure: "The graduation rate has jumped to 77 percent, up by more than 20 points. "* And last month the NY Times suggested Rouhanifard would make a fine choice to return to NYC and take over as chancellor: "In Camden, which was seen as one of the most troubled school systems in the country, Mr. Rouhanifard has improved graduation rates and lowered suspension rates." The problem with claims like these is they lack context. It's great that graduation rates have climbed in Newark and Camden... but what if they've been climbing everywhere? 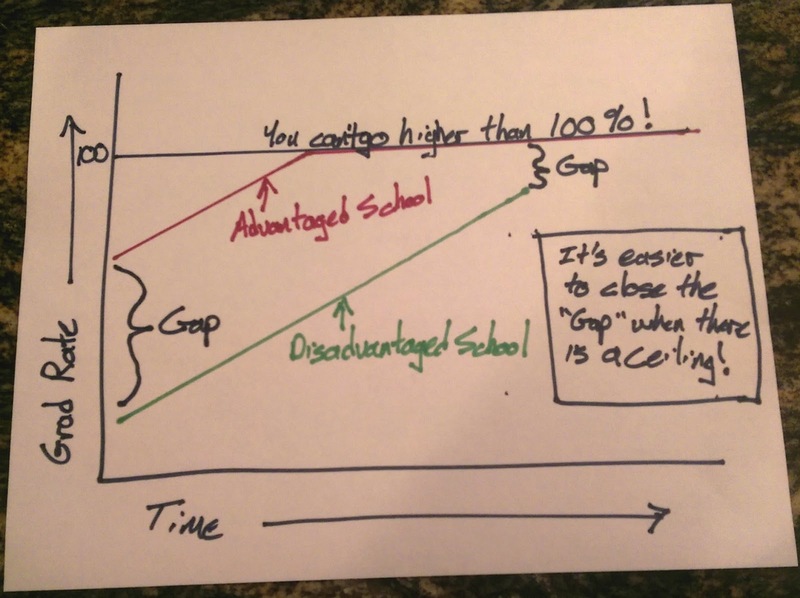 What if the rises in graduation rates are part of an overall trend, and have little to nothing to do with these superintendents' policies or leadership? If that's the case, there's no reason to believe state control has led to better graduation outcomes. You can't have a graduation rate over 100 percent, right? So there's a "ceiling" effect: because so many suburban districts were already graduating almost all of their students, they really couldn't improve. But more disadvantaged districts, with lower graduation rates, could and did improve. It makes no sense to judge Newark or Camden against districts that have graduation rates near 100 percent and therefore can't get any higher. What we should do instead is judge their graduation rate growth against similar districts -- which is what I've done in the brief, and now updated here with 2017 data. To determine which districts we should compare to Newark and Camden, I use the state's District Factor Groups (DFGs). Districts in the same DFG have similar socio-economic profiles; both Camden and Newark are DFG-A districts. The state began a new way of reporting graduation rates in 2011, so that's the baseline year. You can find all the rest of the technical information in the brief. 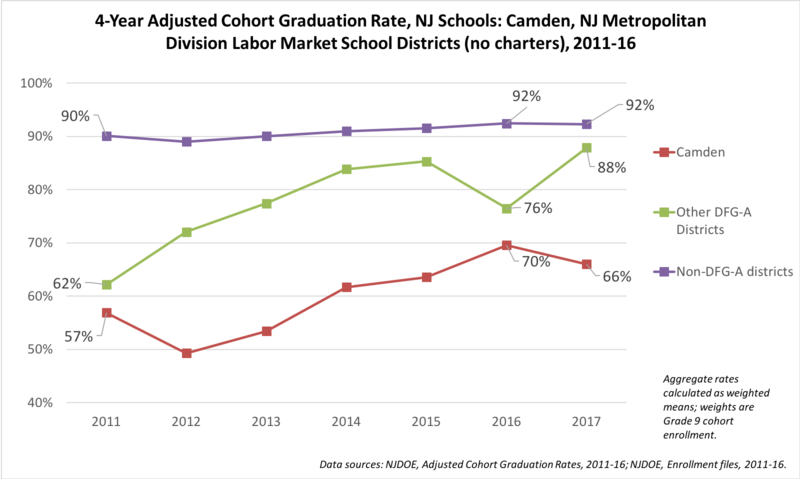 The rise in graduation rates for Newark and Camden simply mirror a trend for all similar districts in New Jersey. You can see this from the green line: all other DFG-A district saw their rates rise 11 percentage points over the past seven years. Camden's rose a bit less; Newark's somewhat more. But there's no doubt an overall trend in rising graduation rates for DFG-A districts explains a great deal of the trend in Newark and Camden. 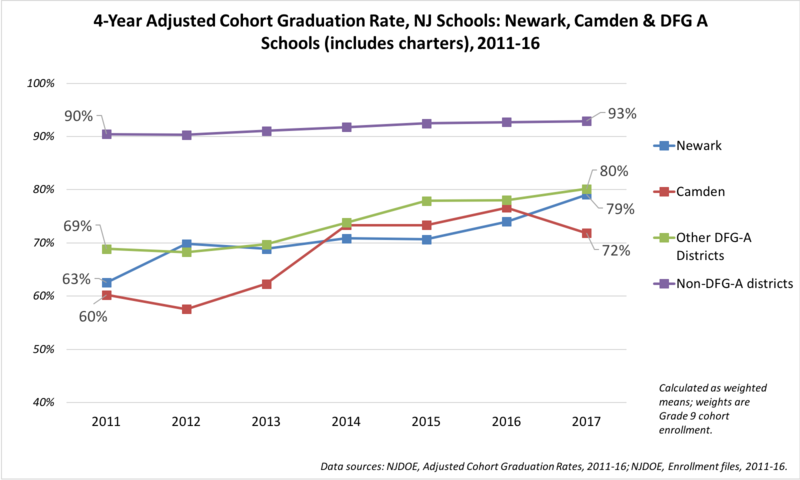 Again, it's clear that the statewide rise in graduation rates explains much of the growth in rates in Newark and Camden -- even when we add in charter schools. Yes, Newark does close the gap somewhat with other DFG-A districts. But I did some econometric modeling, and the change is not statistically significant. The updated regression outputs, using 2017 data, are below. In addition: Baker and I found in our review that there are differences in outcome growth that appear to be correlated to regional differences; in other words, test score outcomes change in different ways in different parts of the state. 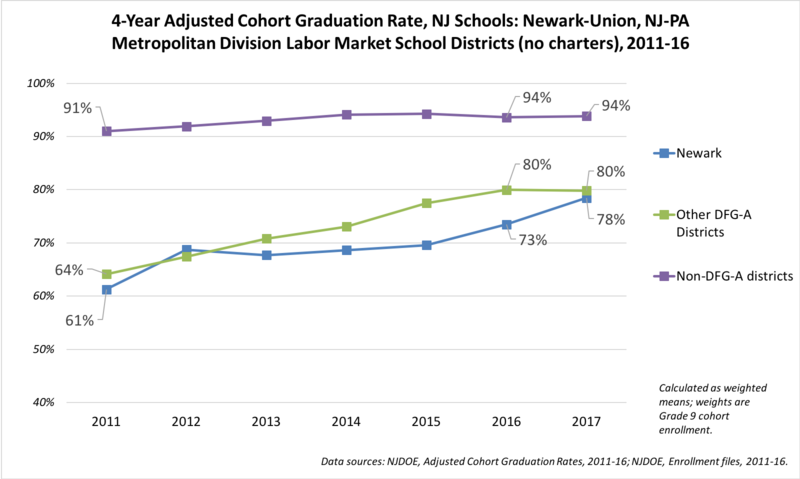 So let's just look at the changes in DFG-A graduation rates for districts that are close to Newark -- in this case, within the same labor market. Newark's graduation rates grew at almost the same rate as all the other DFG-A districts in its immediate area. And Camden? There's only one other DFG-A district in Camden's labor market (Paulsboro). The data are noisy, but it's clear that Camden is not showing outsized growth in its graduation rate; if anything, the district is slipping. I can only conjecture at this point, but I suspect the overall rise in graduation rates may be due to a policy called credit recovery. Newark pushed it hard in 2012, which might explain the initial bump in its graduation rate. Credit recovery includes a variety of programs -- include online learning, summer school, and so on -- that give students an opportunity to make up high school credits in subjects they previously failed. Credit recovery is controversial: there's a lot of speculation that many programs used in credit recovery (especially on-line learning programs) are low in quality. There hasn't been a lot of study of credit recovery, and I don't know of any work specific to New Jersey on the issue. In any case, no matter why the rates are rising, it's clear that they are rising in all DFG-A districts. Which means the claim that Newark's and Camden's graduation rate growth is due to the leadership of Anderson, Cerf, or Rouhanifard is little better than hype. Look, I don't think it's wrong for any superintendent to promote the successes of their school district. But Newark and Camden have repeatedly been held up as exemplars, and reformy folks have pointed to their graduation rates as proof that charter school expansion and state control and "great school leaders" get results. That's just not the case -- and it's unfair to districts like Paulsboro and Elizabeth and Orange and Irvington and Dover and East Orange, which have seen their rates rise just as much, if not more. Most of these districts haven't had large growth in their charter sector, and they remain under local control. Many of their superintendents are lifelong educators, and took the traditional route to district leadership positions: classroom, building principal, central office, with a stop along the way at a traditional university or college where they earned an advanced degree in educational administration. Where is the applause for these leaders? Why aren't newspapers interviewing them? Where are the calls from editorial boards to bring them on board in the biggest urban districts? Why aren't they proof that local control of schools can yield good results? I've noted this before: there are a lot of good schools and good school districts out there, serving many children living in economic disadvantage, that never get their due. They may not have leaders who relentlessly promote themselves, but that doesn't mean we should ignore them. And we certainly shouldn't foist policies on them when those policies come from districts that don't perform any better. * The piece never spells out exactly what the baseline year was for comparison. ** Aggregating the rates of charter and public district schools is tricky stuff. See the brief for how I did it.